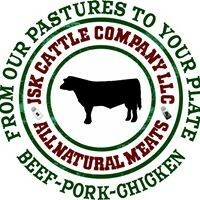 Even though our beef, pork and chicken are straight off the farm, we only sell it frozen. This surprises some people, but the reason we do is because of food safety. Our meats are always fully processed, inspected, packaged and frozen when we pick it up from the USDA meat processor. They do this because frozen foods remain safe for a long period of time, whereas room-temperature meat could start to grow things like bacteria surprisingly quickly. When we pick it up, we bring it back to the farm in a cold plate freezer trailer and then move it into our walk in freezer or the freezers in the farm store. This is our go to method for defrosting meat. It is what we recommend as long as you have time for it. Simply stick the beef or pork in the fridge and it will be thawed in 8+ hours, depending on the cut. For us, this means we usually put steaks or a package of ground beef in the fridge before we leave the house in the morning. If I want to make a roast, I usually put it in the fridge the night before. One of the best things about refrigerator thawing is that the thawed beef can stay in the refrigerator for about 3 days. Some say you can refreeze the meat if it is still in a vacuum sealed bag, but we don’t usually recommend that. This is our second favorite method of thawing, but realistically the one we use the most. And this is the method we tell our customers to use when they purchase a cut of beef or pork in the farm store and want to eat it that night. Put cold water in a pan or bowl and submerge the meat in the water until its thawed. Make sure the water is cold, not hot. We also recommend changing the water bath so that the water remains cold and the meat continues to defrost. You want to keep the meat in its sealed bag until you are ready to cook or season it. There are two other methods of thawing. First, is microwave thawing, which we do not recommend as it will start to cook the meat. The second is cooking the meat frozen. This method will take longer, but does work. I have done this with roasts that I didn’t allow enough time to thaw and didn’t realize it was still frozen in the middle until I was getting ready to cook it.